Peter Bryer: Mobile Foresight: Are BoGo’s back? Get ready for the smartphone two-fors. Are BoGo’s back? Get ready for the smartphone two-fors. Sure, I’m aging myself here, but I have to admit that I’m old enough to clearly remember the pre-smartphone days of the U.S. handset market. You know: the good ol’ days of RAZR’s and RIZR’s and KRZR’s and Stripes. There were 53-hundreds and 6-oh-3-oh’s. There were 83-hundreds and C-4-oh-no’s. Yes, what wonderful days and what wonderful claims. Sometimes products had numbers, sometimes they had weird-sounding names. There was Cingular, Verizon and AT&T. And there were other wireless operators that are now history. You buy one feature phone now, and you get one for free. Yes, everywhere in the U.S. was BoGo territory. All mailboxes were stuffed with an offer or two. then do it again as we had such a good time. Bring a sister, a friend, a father, a mother. Two years and a day for one, then the other. so we give you some hardware and call it a steal. and we’ll be happy to tell you that it’s you who win-wins. two commoditized phones, and you thought you could never afford it. And so it was about half a decade ago. My gosh, how the two-fer offers did flow. and those double-up deals don’t seem quite numerous or plush. But wait... are BoGos making a comeback? I admit that I have no real solid stats to back this up, but using eyeball evidence, it really seems to me that the buy-one-get-one offers have dried up quite a bit as operators began pushing higher-end smartphones. I do remember BlackBerry BoGo deals and perhaps a few for Windows Mobile devices. But as the smartphone market exploded, solid two-for offers for Apple and Android phones seemed non-existent. But now, suddenly, I’ve been seeing more BoGo smartphone deals from American operators. For example, here is one from Sprint. And here was a two-for iPhone offer from Best Buy. 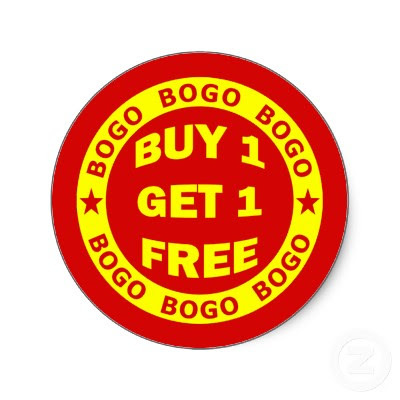 To me, BoGo deals are a solid signal of market commoditization. It’s happening a second time.